Ecological planning is not new. In fact elements of the ideaology we often speak about with such fresh energy has been part of the dialogue for some time - but it seems to be constantly reinventied in new and old ways around the world. This post is on the heels of recent projects by OMA and BIG for some rather square eco-cities, and some more aggregated news clippings, we also juxtapose this with certain recent firebug-as-attention-getting strategies employed to combat suburban excess, and the perils of not being 'green' enough. What we all desire are solutions. To problems, to situations, to clients, and perhaps mostly to all of these that fit into our system of morals but also allows for peaceful coexistence with the rest of the world (animal, vegetable, and mineral). So again, a good point of departure in this striving for the 'latest' thing - is to look at the past to see about some of the strategies, legacies, and opportunities left to us - to remedy, or at the very least, to not keep making the same mistakes over. The trend towards better development and ecological planning seems more recent but has many historical precedents. The perils of urban dwelling have long been predicted, and one that has plagued (or mesmerized) urbanists for decades. 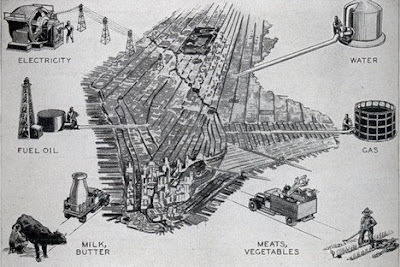 A 1932 article from Modern Mechanix, featured on Treehugger concludes that cities and: "... the infrastructure of gas, water and fuel is too complex, and that cities will become increasingly unhealthy." The article continues in positing that "...SCIENTIFIC prophets looking into the future proclaim that our mammoth cities, the likes of which the world has never seen before, are doomed to obsolescence. In time, cobwebs will enshroud the cloud-piercing Empire State building and dandelions will grow on Fifth Avenue and Wall Street, they believe, after exhaustive studies into the trend of the times... With the disintegration of the city, these prophets say, there will come the development of diminutive villages which will cluster around a trading center, closely resembling the financial district of the present city..."
First, from the UK is the idea of Transition Towns and the additional ideas of full-on Transition Culture. From the site: "People are choosing life and are manifesting that in their lives and their communities. People are starting to see peak oil as the Great Opportunity, the chance to build the world they always dreamt of... This is not a denial of the scale of the challenges we face, rather a practical and instinctual response to it. In towns and cities all over the world people are asking each other “what can we do about this?" The main point that comes through in reading and studying transition culture is the concept of 'resilience'. 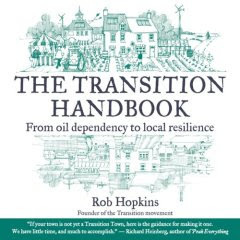 Read more about this in a recently published book that has emerged is 'The Transition Handbook: from oil dependency to local resilience' by Rob Hopkins. We mentioned Peak Oil in previous posts, and this idea of incorporating resilience into our urban (and suburban) areas is a viable strategy that aligns with theories of Landscape Urbanism. The need for resilience is due to constant change in our environment - whether that be good or bad. It is a fact of life, planning, and design, and thus must be acknowledged. How to explain and visualize this to others is a challenge and an opportunity. A recent study in Austrailia (via Treehugger) added another term to the lexicon: "Solastalgia -- "a form of homesickness one gets when one is still at home," according to Australian philosopher Glenn Albrecht; in essence, it's pining for a lost environment. It's the mashup of the roots solacium (comfort) and algia (pain), which, when combined, forms a term (and an idea) reminiscent of nostalgia." To visualize this phenomenon, look to a hot topic such as climate change - and try to make people understand what will change if the tide isn't stemmed (via Treehugger). "The theory is also a very interesting approach to thinking about climate change; it brings local context to a global problem that, to this point, has been very difficult to contextualize on an individual level. 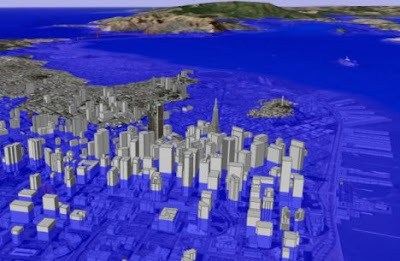 In addition to the predicted rising sea levels (that's San Francisco, above) and other additional consequences like habitat loss, ecosystem destruction and species' extinction, "
"If the United States is ever to reduce its carbon emissions, suburbanites — that is, roughly half of all Americans, said William H. Frey, a demographer at the Brookings Institution — are going to have to play a big role. And lately, they are trying." The shift from suburban to urban green has been slow (from the NYT): "In November, Levittown, N.Y., the model postwar suburb, declared its intentions to cut carbon emissions by 10 percent this year. And a few suburban pioneers are choosing solar heating for their pools, clotheslines for their backyard, or hybrid cars for their commute... But the problem with suburbs, many environmentalists say, is not an issue of light bulbs. 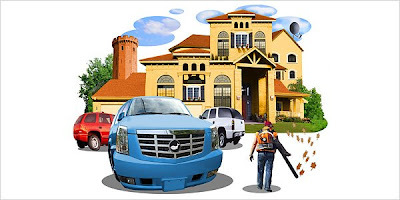 In the end, the very things that make suburban life attractive — the lush lawns, spacious houses and three-car garages — also disproportionally contribute to global warming. Suburban life, these environmentalists argue, is simply not sustainable." This doesn't mean jettisoning the suburban lifestyle, but evolving it to a more environmentally friendly pattern that increases density and reduces house size: "In a 2004 study of the environmental impact on transportation in the Atlanta metropolitan region... Lawrence D. Frank, a professor of sustainable transportation at the University of British Columbia ...found that the average carbon emissions per person per workday were about 10 percent lower in neighborhoods with six to eight dwellings per acre — a typical suburban layout — than in a more spacious one with only two to four dwellings per acre, simply because people drive shorter distances in denser suburbs." "For millennia,” they write, “the city stood out against the landscape, walled and compact. This concept of the city was long accepted as adequate for characterizing the urban experience. However, the nature of the city, both real and imagined, has always been more permeable than this model reveals... When you start into the ten essays in Urban Imaginaries, the writing can be pretty dry and academic. But the larger point is a relevant one: that grasping and defining and describing the city, as if there is one uber-city template, can easily flounder." A tangible example of adaptation and evolution in the Bay Area is the current revitalization of Treasure Island. Currently a Superfund site, it was (via Treehugger): "Originally built for the 1939 Golden Gate International Exposition, the man-made island was constructed out of dredged sea bottom poured into rock walls and covered with soil. The island then served as a Naval base from WWII until the 1990's." The site is found between San Francisco and Oakland and is currently envisioned as an ecocity for 13,500 people. Via Treehugger, an overview of some of the sustainable features: "...streets will be angled in order to maximize solar energy for heating, cooling and lighting and protect residents from the wind. Every single building built on the island will have LEED Gold certification. About half of the island's 400 acres will be set aside for open spaces, including an urban farm to supply organic local food to the residents, constructed wetlands to purify storm water runoff, and a restored natural forest ecosystem. All food scraps and grass clippings produced on the island will be composted for use by the farm. Electricity will come from a combination of solar (drawn from solar panels on the island's buildings), wind and biogas, and possibly also tidal energy." "Former eyesores are being reinvented as large retail properties, with anchor stores like Home Depot or Target. One factor behind this trend has been a state incentive program that just had its 10th birthday, said Paul D. Cohen, a broker at CB Richard Ellis who recently became head of the firm’s new group specializing in redeveloping New Jersey’s brownfields... The Brownfield Reimbursement Program, which the state created in 1998, allows developers to recoup 75 percent of the costs they incur for the environmental cleanup of brownfields." 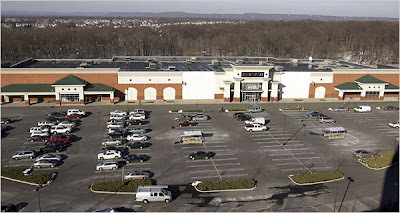 While remediation and opportunity has opened up the potential for profitable redevelopment of brownfield sites around the country - as well as to look to infill development to reduce sprawl - development of big box power centers and other land-intensive development merely shifts the impact from one of a site-specific blight to a pattern of economics and social fabric that is not sustainable as well. It may be a lesser evil, but at best a baby step in the right direction. This trend could shift as big-box stores such as Wal-Mart strive for more sustainable practices - even if the only 'green' they want is money. "As we step into this new Urban Age, those of us arguing for the City As Solution must focus on the joie de vivre urbaine. For cities to reach their full potential as engines for change, the urban chorus will need to grow louder and brighter. The masses should be reminded of the joys and conveniences of living in vibrant, eqitable urban neighborhoods, not guilt-tripped out of their McMansions and driven into gentrifying neighborhoods to exacerbate socioeconomic inequality. Only when a person believes that they will enjoy something -- and that they deserve to -- will they make a real effort to change their way of life."